Retailers who invest in quality shelves for their stores give themselves a competitive advantage during the holidays. Premium quality, painted shelves for stores of all sizes help make merchandise look more attractive. Eye catching displays grab the attention of shoppers instantly. Brightly colored shelves match store interior design much better than do drab, chipped display racks. These shelves are intended to create a winning edge over competitors that are desperately trying to push volume without thinking strategically about more subtle, effective methods of recession proofing sales during tough times. It is not so much a matter of the number of shelves in the store, as the quality of the displays themselves and the way they are arranged to make shopping easy, enjoyable, and convenient for this year’s very cautious and worried Christmas shopper. 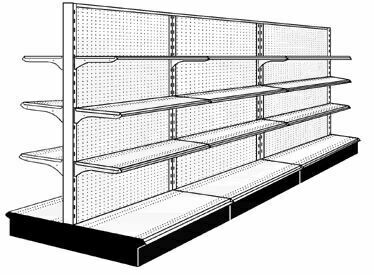 There are only two basic types of shelves used in stores. Double-sided shelves are used by stores to create aisles for shopping. They are easy to move in any direction because they are made with a single-piece construction. Some retailers attempt to save money by buying only single-sided shelves for their stores and stacking them back to back. This creates uneven displays and makes it difficult to rearrange store layouts. Single-sided shelves are better used for store wall displays and end caps. Measuring only 48” across, they are ideal for filling in gaps along the wall, or in turning an unused corner into a sales special display. Incidentally, double-sided display units also measure 48” across, allowing for easy mobility and the seamless fitting of end caps to the ends of the aisles. Better shelving can help stores recover losses that often result from high levels of theft during this time of year. If store shelving is too high, people can hide and easily steal merchandise. Very tall shelves can even block the electric eyes of cameras, or obscure a miscreant’s face in shadow. Any store looking to improve its loss prevention should call Easy Rack and discuss the size, arrangement, and height of its shelving. Our experience has shown us that the ideal height for shelving in stores is approximately 72”, although some larger stores with very tall ceilings and multiple cameras can use shelves as tall as 84”. Nothing taller than 72” is ever recommended for smaller retail outlets like local dollar stores, gift shops, or convenience stores. Sometimes storeowners hesitate to replace their shelving units for fear they will lose valuable merchandising space. This is not the case with Easy Rack shelves. Store owners can fit more on these shelves than they can on similar models due to the adjustability they feature. 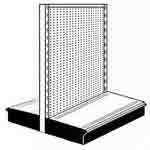 Individual shelves can be moved up or down or adjusted at varying depths to allow more light to reach merchandise. Many stores have displays that look darker at the bottom than they do at the top. This is because all the shelves extend equally outward from the center. By varying the depth of higher and lower shelves, stores can overcome this problem by making certain that every square inch of space is exposed to the light. Even though the new shelving display make be shorter than the one it replaced, it can still be used to hold larger items and greater quantities of merchandise. This is because each shelf by itself can easily support up to 350 pounds in weight. Easy Rack carries a wide variety of shelves, dock loading equipment, commercial shelving, material handling equipment, used pallet racks, and modular buildings installed nationwide. If you can not find what you are looking for call us toll free at 1-888-776-3720 and we will find it for you. Our home office is located in Houston, Texas with regional distribution centers located in all 50 States including New York NY, Los Angeles CA, Miami, FL. Chicago, IL. Denver CO., Dallas TX, San Antonio, TX, Austin, TX, Brownsville, TX, Grand Prairie, Texas, Pasadena, TX, Mesquite, Texas, McAllen, TX, Carrollton, Texas, Boise ID, Atlanta GA, Albuquerque NM, Raleigh-Durham NC, Washington DC, Albuquerque NM, Huntsville AL, Fayetteville AR, Norfolk VA , Madison WI.